Family Connection is a customized planning portal for students and families. It offers self-discovery assessments, goal-setting, college research tools, course planning, career exploration resources, and individual learning plans. identifying careers it will also identify potential college majors. As a Sophomore you will be introduced to the multiple capabilities that Naviance can offer. The Career Interest Profiler is your initial step in discovering how to identify your interest and match them to potential careers. After completing this inventory your interest areas will be highlighted in green. Careers that match your strongest interest areas will be identified in your student portfolio. This tool will help you to think about life after high school, so you can plan out your high school course pattern, select a college major and a college. Juniors, if you haven't started building your college list, don't worry, Naviance can help you with that! 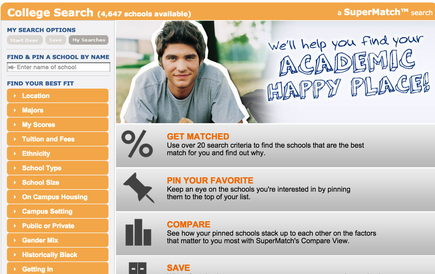 The SuperMatch tool will create an instant list of colleges to match your personal preferences. It will also give you the capability to compare colleges, learn about admissions requirements and save your college lists. If you would like to receive email notifications for upcoming college presentations, then simply save your colleges in your student portfolio. Forgot how to log in to your Naviance Account? Need help with the Super Match Tool?